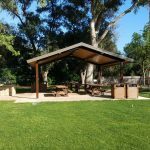 Sarzotti Park has three beautiful, new, covered Picnic Areas that are now available to rent. Each area is equipped with a full size barbeque, and electricity and lights are available at an additional cost. 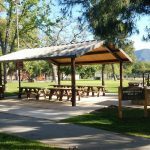 Surrounding the picnic areas are shady Oak trees, horseshoe pits, a playground, and restrooms. 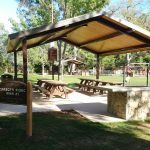 Click here for the Sarzotti Park Picnic Rental application. You may print, sign, and e-mail or fax this form to ojairec@ojaicity.org or (805) 646-0201. Rentals are pending calendar availability and are on a first come, first served basis. 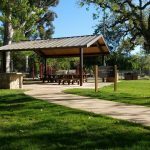 Contact the Ojai Recreation Department office at (805)646-5581 Ext-390 for availability. Closest to the parking lot, accommodates up to 50 people. Closest to the restrooms, accommodates up to 100 people. 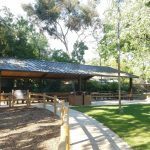 Closest to the playground, accommodates up to 50 people. For information on renting sports fields, please contact Allyson DesBaillets at (805)646-5581 Ext 306 or DesBaillets@ojaicity.org. 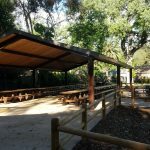 For information on renting other areas such as the multi-purpose room, Gymnasium, game room, snack bar etc., please contact Sophocles Cotsis, at (805) 646-5581 Ext 301 or cotsis@ojaicity.org.